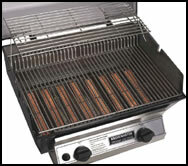 Broilmaster R3 Infrared Grill - The Ultimate Grilling Experience for Steak Lovers with its independent burner management, 3-level adjustable cooking grids and multi-position lid stop, the R3 Infrared Grill provides a broader temperature range (as low as 350 degrees) and control unmatched in other infrared grills. This cooking versatility lets you sear steaks, chicken or chops; indirect cook a roast or turkey; and even bake pizza and cookies. The two burners generate up to 1,600 degrees F at the surface to instantly vaporize drippings and, as in most high-end restaurants, use infrared heat to cook foods to perfection. A host of stainless steel components ensure a lifetime of service - multi-level cooking grids, Retract-A-Rack, adjustable lid stop, and control panel. 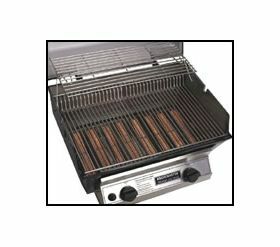 • R3 Infrared Grill provides a broader temperature range (as low as 350 degrees) and control unmatched in other infrared grills.